Completed in Summer 2005, this beautiful stone-clad villa is set into the hillside on the exclusive Kas Peninsula and benefits from superb sea and mountain views. Finished to the highest standards with quality fittings throughout and extensive marble flooring, the villa is set out over 3 floors. Ground Floor - open-plan lounge, dining area, and kitchen, cloaks and WC. First Floor - master bedroom (en-suite), bedroom 2 (double) with balcony, bedroom 3 (2 singles), bathroom. Pool level - very large bedroom with en-suite and separate seating area with own private entrance from pool terrace. The villa is equipped with all mod cons and has air-conditioning throughout. The 35m2 pool has an infinity edge and alfresco dining is catered for both on the balcony and on the poolside terrace. Bathrooms on the ground and first floors have marble floor tiles and contemporary custom made vanity units, mirrors and wall lights of an exceptional quality. Alfresco dining for 6 on balcony (wrought iron furniture) or dining for 8 on pool-side terrace. Swimming pool has infinity edge and an outdoor shower is provided. Due to the number of steps we do not consider it suitable for young children or those with walking difficulties. There is a weekly clean and linen change and beach towels are provided. Daily refuse collection. Fresh bread and pastries delivered daily on request. The villa itself is really tastefully decorated and well looked after. There are three bedrooms in the main house with 2 bathrooms and a downstairs toilet. The balcony leading out from the kitchen level had a beautiful view and was magical for enjoying breakfast and played evening cards. The pool and BBQ area is down a set of stairs surrounded by some nice gardens. On the pool level there is a very large double bedroom with en suite that also has it's own fridge and kettle. If you are a big family with young children this perhaps wouldn't be ideal (to be separated from the main house), however, as we had 3 teenagers and 2 adults it was perfect, as it gave everyone a bit of privacy and space if we needed it. The pool and view is to die for. I still miss it now. Whilst we were there the villa manager helped us with setting up the BBQ and preparing some food one night - a really nice touch. The villa is situated on the Peninsula (at the top of an exceptionally steep road). It's about a 5-10 minute drive into Kas harbour. There is a hotel and beach club just at the bottom of the road (5 minute walk). Taxis into town were set at 30 lira each way (about £5). As the restaurants are so reasonable, an extra £10 return a night for cabs didn't feel unreasonable and it means you get this amazingly beautiful location to retreat to and still be able to enjoy a glass of wine. We did hire a car but to be honest, it was a waste really. We used it twice in a week and only really did that because we felt with should. We hired a boat out from Kas Harbour for the day (ECE Boat Tours, the skipper and his wife could not have been nicer). The lunch they provided was excellent and the boat stops were brilliant for swimming in. Another day we took the ferry over to Meis (Greece) and did a trip to the Blue Grotto, which I'd definitely recommend. You can also get taxi boats to beach clubs from the harbour for the day. Another day my daughter paraglided off the nearby mountain (£50). She's 15 and she loved it. There is plenty of opportunity to either go or learn to Scuba Dive in Kas. We had a really great time in Kas and the villa was exceptional. The villa was amazing ... the views were spectacular.. every need was catered for... would we go back? In a heartbeat.... Kas was fantastic.. the restaurants, the atmosphere, the people... best holiday ever!!! This villa is amazing beautiful and luxurious the views are out of this world. Waking up to amazing views and having breakfast by the pool sunbathing & relaxing what more could you ask for! We visited Kas having never been to Turkey before and fell in love with it. The villa is spacious, clean and comfortable, set out over 3 floors with the lower floor being self contained (not connected internally to the upper 2 floors). The pool area is where we spent most of our time, taking in the stunning views past the infinity pool. The villa is positioned on a steep hill which allows for the fabulous views and is surrounded by beautiful olive trees and plants and flowers of vivid colours. The trip into Kas takes 5-10 mins by car along the scenic coast road and more stunning views. Beware of the Turkish style of driving which is much more haphazard than the more formal uk style (no one indicates, people seem to park in very random places and most drivers position themselves in the middle of the road until something comes the other way!). Kas has a lovely atmosphere and comes to life at night. Lots of families out, entertainment provided by the ice cream vendors and all of the shops and restaurant stay open until very late. The Friday market in town is a real experience, where you can buy food, textiles, technology, clothing, jewellery etc. Be ready to barter! We visited the amphitheatre at night which was stunning. It's tucked away with no real signage so you need to find it on the map to get to it. Aim for the bus station as you drive from the villa on the coast road toward Kas and you will find it at the end of a dead end road. We went on a boat trip with Captain Ergun (see Trip Advisor using his name to search). It was amazing, stopping at 3 different spots for swimming and snorkelling in very quiet locations. A husband and wife team who were very welcoming and made it a great day out. Gorgeous BBQ lunch and lots of snorkel equipment etc to use. Our local contact delivered fresh bread each morning before we were up and washed the pool area down to keep it clean. We didn't see much of him otherwise but we knew where to find him if we needed anything. A lovely place to visit and relax. With our thanks for a wonderful stay. My husband and I have stayed in Kas many times, usually staying at the delightful Deniz Feneri Lighthouse Hotel. However this year I had limited holiday available so we decided to book this lovely villa, which fitted in with our dates. It was everything we hoped it would be. The description on the website is very accurate and Ayhan, the neighbour, was brilliant. He bought us fresh bread everyday and came straight round when we accidentally locked ourselves out of the villa. We used a local taxi Guray Ozdemir (+90535 549 5578) who speaks perfect English. His father Errol was the main driver and took us into Kalkan on several occasions. We thoroughly recommend the villa and will be booking again. The overall quality of the villa is excellent. The furniture, fittings and equipment are all of the best quality and very comprehensive (e.g. including towels for the beach and pool). There are sea views from all parts of the villa. The daily service delivered fresh bread, cleaned the pool and patios and prepared the BBQ on request. The villa is well situated, approximately 5 to 10 minutes from Kas by car and with many options for beaches within a short distance. In Kas there is an good choice of shops, excellent restaurants, cafes and bars. The owner was very helpful in answering any questions and organising additional services such as airport transfers and car hire. We found it very advantageous to have a hire car, but there are plenty of local taxis and a frequent dolmus service into Kas. Kas is the ideal holiday location for the discerning tourist - a harbour town in a magnificent setting against the backdrop of the Taurus mountains. There are plenty of restaurants, cafes, bars and shops within the series of pretty cobbled streets, promoting a great ambiance without being too commercialised. 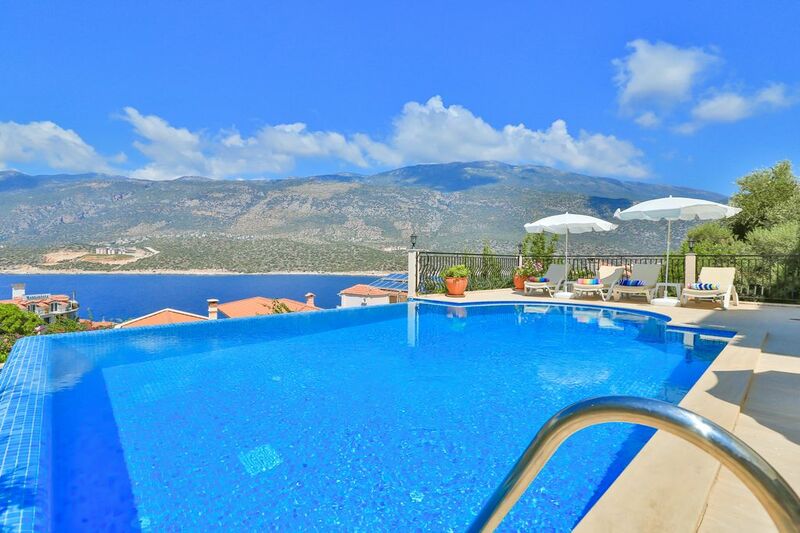 Days can be spent either relaxing by your own luxury pool taking in the magnificent sea and mountain views, or for the more adventurous there are many activities on offer - diving, paragliding, cycling, walking, boat trips, sea kayaking, horse riding, gorge scrambling etc. that can be organised in the town. Kas has two pebble beaches and beach clubs (free entrance) and a superb sandy beach at Kaputas within 20 minutes drive. Kas lies within the ancient Lycian empire and evidence of the town's rich history are much in evidence - ancient tombs and amphitheatre. For those interested in the cultural history there are many sites and places of interest in the region. Booking procedure. A 25% deposit at time of booking. Final balance 8 weeks prior to arrival. All reservations made within 8 weeks of arrival will be payable at time of booking. An additional security deposit of £200 is required. Discounts negotiable for parties of 4 people or less outside high summer. Car rental and airport transfer packages available.